Christina’s sister was 28 when she was formally diagnosed with borderline personality disorder, though Christina, who asked that we not use her last name to protect her family’s privacy, says there had been signs of the disorder for years. Beginning in her teens, Christina’s sister, now 30, struggled with eating disorders, self-harm, addiction and suicide attempts, and her family often felt they had to “walk on eggshells” around her to avoid triggering a change in mood. According to the National Institute of Mental Health, BPD is a mental illness that causes mood and behavioral instability, which can lead to impulsive decision-making and unstable relationships. Episodes of anger, depression and anxiety are common, too, as well as the behaviors exhibited by Christina’s sister. But Christina plays a vital role in her sister’s well-being, acting as her confidante and emergency contact, and offering her compassion where others might not. “She doesn’t have a very large support network, since she tends to lose relationships or cut people off. She knows I am always there for her, whether we are on speaking terms or not,” Christina says. Acting as that safety net often falls to siblings. A 2008 study of individuals with schizophrenia found that the vast majority were unmarried and therefore didn’t have partners to care for them. Since parental support can’t last forever, most schizophrenics in the study turned to their siblings for help; the same is true for people with other types of mental illnesses. Considering about 1 in 5 Americans will experience mental illness in any given year, plenty of siblings will be called on to provide support. Rebecca Chamaa, a 51-year-old San Diego-based writer who suffers from paranoid schizophrenia, says she receives support from her three brothers, and that is vital to her well-being. Doctors help to manage medications, their side effects, therapy and treatment for major episodes, but many conditions require a different kind of help: compassionate daily support. Chamaa’s illness often manifests as paranoid thoughts about food, she explained. She may think it’s poisoned, spoiled or otherwise inedible. Because her brothers understand where she’s coming from, they are often able to convince her that her food is safe to eat, she explained. Christina says that she’s delved deep into BPD research, doing exactly what Chamaa describes, and it’s helped her support her sister. Experts agree that fully understanding a family member’s diagnosis can help those in a caretaking role to be more compassionate. 1. Keep an open dialogue about mental health, and understand your sibling’s symptoms. Chamaa says after she revealed her paranoid schizophrenia diagnosis to her extended family, they were kinder about certain behaviors of hers that seemed “odd,” like having to leave an event abruptly to lay down and sleep (a side effect of her medication). “I had more leeway to be myself,” she says. An open dialogue about her mental illness helped her family to provide her better support. 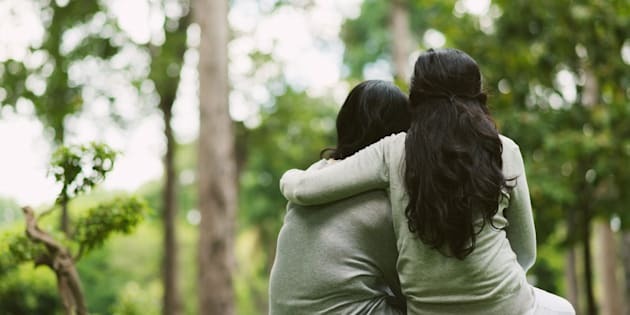 Florence Leighton, a psychiatric nurse practitioner based in New York, adds that understanding your sibling’s diagnosis and why certain behaviors occur is an important part of being compassionate. 2. Check in on a sibling who is isolating. As Chamaa describes above, people with mental illnesses can sometimes lack motivation, so things like getting out of bed, showering, changing clothes and leaving the house can feel impossible. That’s why Chicago-based psychotherapist Carolyn Cole recommends checking in on your sibling if they’ve begun to isolate themselves. 3. Try not to get frustrated or angry about mental health symptoms. If your sibling has a crisis while you’re out together, though, Cole says it’s important to try to de-escalate the situation. 5. Young children can be supportive, too. Conditions such as ADHD, anxiety, depression and autism are often a part of childhood, too. If you’re a parent of both a mentally ill child and a child without mental illness, talk to the latter about their sibling’s condition using words that are simple and age-appropriate. “Some ideas of things to say could include, ‘Your sister has an illness that means that her brain sometimes has trouble with certain things. It’s not something that you can catch, and it’s something that we are working on with her doctors to help her feel better,’“ suggests Eleanor Mackey, a psychologist at Children’s National Health System. She adds that parents should make special time for their children without mental illness and provide them with resources, since they may be growing up in an intense or stressful environment. Still, parents can foster a family culture of understanding by directing such children to express love or support for their mentally ill siblings in developmentally appropriate ways. Mackey recommends having a child write a letter or draw a picture for their sibling to let them know they care, or suggesting the child bring their mentally ill sibling a favorite toy, or playing music the sibling likes, to provide comfort. Because of incidents related to her sister’s BPD, Christina suffers from her own symptoms of anxiety and post-traumatic stress disorder, and is in counseling to cope with the effects of having to keep her sister from taking her own life, among other things. She recommends others with mentally ill siblings seek out the same treatment. Cole notes that while siblings may feel guilty at first about setting boundaries, it’s a necessary part of your caregiving role. Without boundaries, limits and self-care, you may become angry at or resentful of your siblings — and that’s helpful to no one. “Define ‘crisis’ with your sibling (i.e. fire, locked out of apartment, feeling suicidal, etc.) so you both are clear on what a crisis means, how they will let you know it’s a crisis vs. just calling to talk, and who the sibling could call if they cannot get in touch with you at that time,” she recommends. Siblings can also seek out support through the National Alliance on Mental Illness, which offers support groups for family members of those with mental illnesses.